"Brains are gorgeous at the right magnification", says Mark Miller on his "neuro" set of photos in flickr. 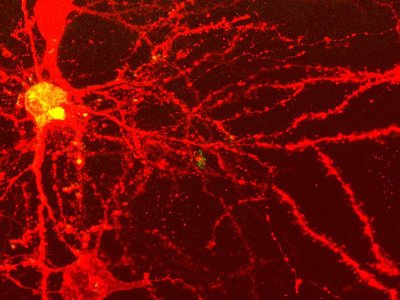 Self-described as an intracellular recording artist, Miller in this set shows 17 striking images of a mouse's neuronal network. 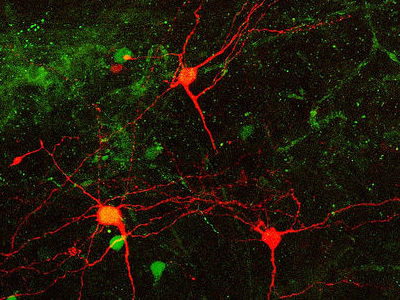 Covering different areas of the brain such as the cingulated cortex or motor cortex, the images are quite impressive, particularly since the neurons connecting in the brain resemble the large-scale structure of the universe. See the Millennium Simulation to better understand this noticeable similarity. Other representations of neuronal networks can be seen here and here. You gotta love this. Yesterday on the Paul Harvey Show, Paul described your work. And said you had discovered an image of the "entire" universe was identical to a single cell of a "human" brain. Good ol Paul. Probably thought it would be offensive to say it was a brain of a mouse. So what is the universe made of? Men or mice? Hello Mark Miller, I have to say that I am completely intrigued by your findings! I am a Social Science and Reading teacher at the High School level and one of my students told me to look up your work. My students know I enjoy researching and learning about interesting topics. I would love to learn more about this subject. Thank you for your research. I happen to believe this proves God Almighty.